Rap sheet is a short name for Rapaport Diamond Price List -a pricing system based on different factors such as: shape, size / carat weight, color and clarity. Additional factors that affect the cost are cut, polish and symmetry grades. The cut grade is usually listed as % on top of list prices. RAP sheet is a hypothetical system of evaluating the cost of diamonds for “wholesale” (and now in the Internet days, for retail) transactions. Although these prices are just a guideline as to what loose diamonds should cost, most jewelers use the Rap sheet to evaluate and price loose diamonds, as well as rings and other pieces of diamond jewelry. Using this guide, we will teach you how to negotiate and get better pricing when getting a diamond from a jeweler. In the following guides we will also explain how to choose the best diamond on a budget, as well as why you should NEVER buy from national jewelry chains (located in malls) such as Zales, Kay Jewelers and others. RAP sheet is intended to be used by jewelers ONLY, and is meant to not be shown to retail buyers. Jewelers who get access to Rapaport Price List, pay an annual subscription fee (about $250 / year), and sign a sort if confidentiality agreement that they will not disclose the RAP sheet to the public. On top of that, RAP sheet is copyrighted, so most people do not want to risk putting it out in public. Below you will find the most common version of RAP sheet from August 2012, that covers round / brilliant-cut diamonds ranging from .01 – 10.99 CT, which is still very relevant in 2013. Although it is now almost 8 months old, it is still very much relevant, as prices did not go up more than 3-5% on average. This report was originally posted by someone and is now making rounds on the web. 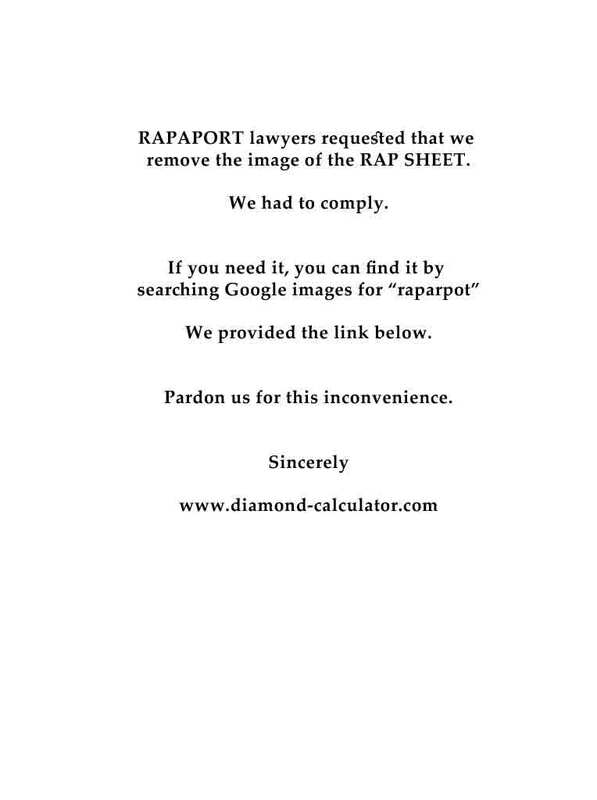 We found this report on Google’s Image Search – check for yourself by searching for “rapaport diamond report”. 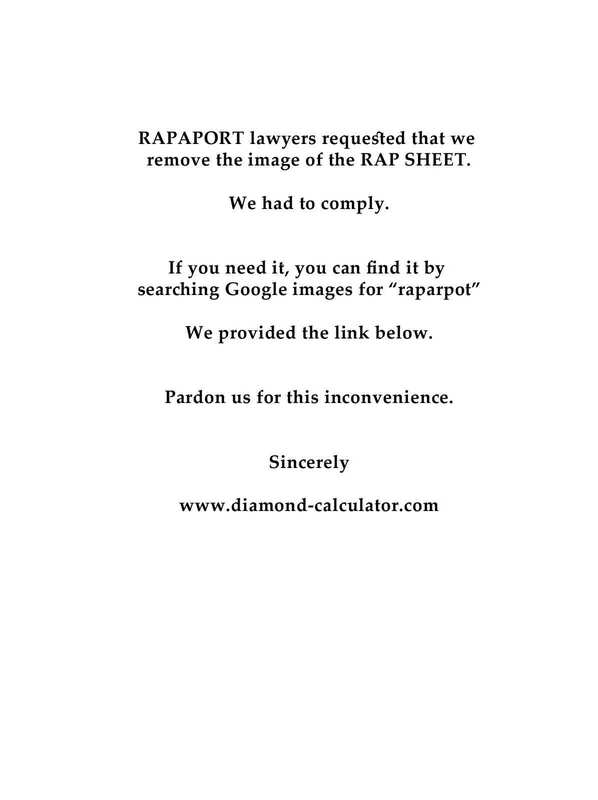 RAPAPORT lawyers requested that we remove the image of the RAP SHEET. We had to comply. If you need it, you can find it by searching Google images for “raparpot”. Pardon us for this inconvenience. Page One: 0.01 – 0.89 CT. Page Two: 0.90 – 5.99 CT.
By having access to the Rap sheet, you as a consumer, can put it in front of a jeweler, and negotiate the best deal, or at least a fair price. Note that this will only work at independent jewelry joints. It will NOT work in any corporate mall chains such as Zales, Kay, Ross-Simmons, Tiffany, etc., because there you are dealing with robot-like sales-people and managers, as well as corporate pricing structure, which is completely inflexible. Another thing to consider about corporate jewelry stores is that most of their diamonds are low quality (CRAPP), and very high list price (about double the Rapaport prices or more, and they usually do not sell loose diamonds and do not do custom jewelry design and work. Read my opus on why you should NEVER buy at Zales. Check out our Diamond Buying Guide series: one from my perspective – “Man’s take on buying a diamond” and one from my fiance – “Women’s take on getting the best diamond engagement ring”. You do not have a contact page so I am commenting here. Love your service and website. My business, Trade In My Diamond is an online source to trade your diamond for cash and a moissanite replacement jewel. Obviously, some people are going to want to know what their diamond is worth before sending it so I was thinking of linking to your site. Would there be an opportunity for you to link to tradeinmydiamond.com as well? I love this info for the public diamond buyer. I have sold GIA diamonds for 33 years below the Rap list—although some diamonds in high demand COST wholesale jewelers more than the Rap price list. It depends on the stone. I also sell gorgeous mountings at wholesale, handle the labor, and the appraisal for insurance. The customer comes away with a great piece of jewelry truly at wholesale. I have always worked out of my office and do not have ‘jewelry store’ over head. My phone number is: 417886-8090. My local company name is: Pave’ Investments, Inc. My name is Lynda Salvador in Springfield, MO. Hii if any one need gia certified diamond with discount then contact me on (watsapp)..